Certiﬁed mobile mechanics can take care of your vehicles’ scheduled maintenance and repairs in your ofﬁce parking lot or parkade. WrenchPatrol is a BBB accredited business, employs certified technicians, and offers full warranty. 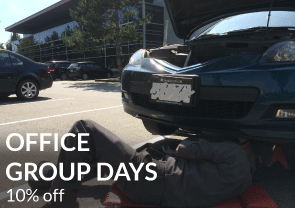 You and your colleagues might like to try us out with a simple oil change each. 2. We create a personalized sign-up form for your team.